Lately in the Shepherd house I’ve been really into teaching my kids (who are both under the age of 5) how to do chores while my husband has been really into our vegetable garden. These two things may not seem related, but they are. At least they were…today. Kris is the faithful ruler of our garden. He looks after the plants, he waters them, he trims them, he reads about them to know better how to care for them. They are his babies…just like the cats are mine. Every now and then I go and look at the plants to see if there is anything I can eat yet, but that is pretty much the extent of my help. Today, Kris asked the girls, as he often does, if they were interested in helping him water the tomatoes (strangely enough we have three toy watering cans — none of which we bought, and I still don’t know how they ended up in our house — which are the perfect size for the girls), and they jumped at the chance. They love using their watering cans. Kris filled the cans in the kitchen sink, then promptly went outside. I (loving when the girls do chores) watched the scene unfold. “A,” who is tall enough to reach things on the counter tops, gingerly picked up the cans and handed one to our resident wild child, “Z.” Both girls realized what a big job was before them, and carefully began teetering slowly through the kitchen and toward the living room. The trek was a long one and would require them to make a right turn and cross another room before they were safely at the back door. Glass of water in my own hand, I surveyed the situation. Kris doing chores: good. Girls doing chores: good. Me taking a break and drinking water: good. This is when I noticed that, despite the girls being as careful as they could with their buckets of water, water was indeed splashing over the sides and leaving a trail of drops across the floor. Ever the cool and calm one (HA! ), I smiled and day-dreamed about the day they could do all the chores in the house without our help. Despite a few drops, I was pretty proud of them. Quickly, because the watering cans are so small, they were back in the kitchen asking me for a refill. Stupidly, I filled the buckets almost as full as they could go. The girls, with more excitement under their belts this time because they had just done a GROWN-UP job, walked with a little more confidence and a little faster. More water than before began to slosh over the sides of their buckets and I began to realize the trail of water was actually becoming a bit of a mess. A third time, the girls appeared, needing more water (“We should invest in some real cans,” I began to think). I filled the buckets again — YES, TO THE TOP — and “A” ran out of the room while “Z” followed. Suddenly I had a thought, “Z is going to fall and spill her whole bucket.” Call it my mom-sense, but as soon as the thought went through my brain Z was on the floor, and so was her bucket of water. I took the majority of the blame for this as I went to get a towel, because it was I who enabled a tiny child to run a bucket of water through the house with minimal supervision. There were a number of things I could have done differently to ensure the scenario before me hadn’t happened. However, I think by allowing this situation to unfold the way it did, my girls learned a few lessons: they learned how to water the plants; they learned how to carry and not carry a bucket of water; they learned the importance of going slow; and they were encouraged to try something new and contribute to our family. It was messy. I had to get out the big towel to clean up the floor. It took more time than if I…who am I kidding… Kris had just done it himself. It was slightly annoying that my children weren’t as competent water carriers as I knew myself to be. Yet, it empowered them. And it became spiritual for me. How often does God entrust us with a gift, a talent, a job, a relationship, a position, a moment that is meant for us to carry for our good and most likely somebody else’s good? I picture God entrusting us with GROWN-UP things (relationships, skills, jobs, everyday instances) and it being like that hand off of a watering can. “Here you go kid. Go water some tomatoes. Make this world a better place.” Of course, there are no real tomatoes, and the watering can is metaphorical. But can you see my point? God gives us things to hold which are for the benefit of something greater. And we are like babies running around with watering cans. Some of us take our cans gingerly, and we begin teetering slowly, carefully as to not mess up even just a little bit. Some of us, those with a little more experience or confidence, take the can and move a little faster. The wild ones grab the bucket and they are off. Here’s the thing…no matter how fast we move, or how timid we are, no matter how confident we feel, or overwhelmed we may become, there is one thing that is true for every person in this story: if you give a bucket of water to a child under five and have them walk it through the house, water will spill. If you give a child a grown-up job, they will make a mess. 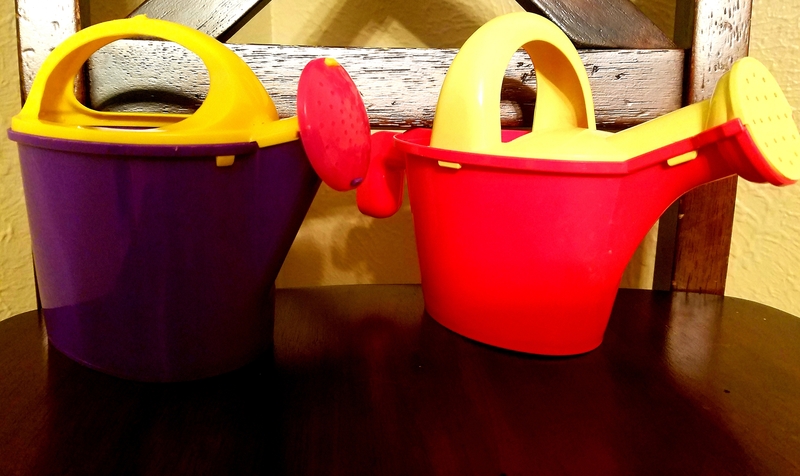 So I’m sitting here, thinking about watering cans…and God…and messes. I’m thinking about why the God of the universe would give people such important things to do. I’m thinking about the messes we are likely to make when God entrusts such important jobs to us. I’m thinking about what it means to enter into the work of God… knowing that we will likely slosh some of the water off the sides of the bucket. I’m thinking about the concept of grace…wondering what role it has in all of this: from God, for us, to others. I’m wondering what’s important to God in this life. Is he really concerned with the tomato plants being watered? Probably to some degree. But if that was his main goal, he doesn’t really need us. Love the way you weave your daily !I’ve into Biblical truths. Keep it going!